Hurricanes and typhoons wreak havoc on poorly constructed homes. Winds tear roofs and walls apart and flood waters inundate homes, causing the inhabitants to flee to higher ground. An overall better solution is needed for low-income housing in disaster-prone areas. One potential idea is to build a solid, disaster-proof core to hold the home's key elements, and is designed to survive through the strongest of storms. Surrounding that core is a series of bamboo living units that will take the brunt of the storm, but afterwards will be inexpensive to rebuild. 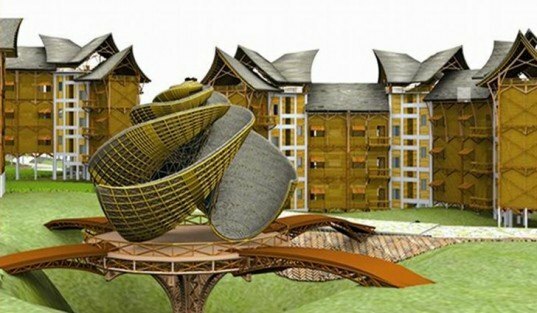 These unique bamboo houses are part of a much larger disaster resistant community concept for the Philippines designed by a group of Indian architects – Komal Gupta, Vasanth Packirisamy, Vikas Sharma, Sakshi Kumar and Siripurapu Monish Kumar. Their entry for the Design Against the Elements Competition is a master planned eco community with cluster housing units, two community centers, prayer and mediation space, a library, and lots of open green space. Bioswales, rainwater collection, grey water recycling, plantations, commercial space are also incorporated to make this a mixed-use, sustainable community. The housing concept is a three-story apartment building built on stilts with an earthquake, wind and water resistant core. This core holds all the necessary elements, like water lines, power, staircases and each apartment’s kitchen and bathroom. Radiating out from the core are three living pods per floor, inexpensively constructed completely out of bamboo. Each family also has access to the roof and an escape hatch for the most dire of storms. Stilts help the house withstand flooding from storms or monsoons, and should the bamboo living pods get torn off they can easily be reconstructed when the family has time and can afford it. Spurred on by the devastation caused by the tropical storm Ondoy (Ketsana) in the Phillipines in 2009 MyShelter Foundation launched an entire design competition to create disaster proof housing. The winning entry from the competition will actually be built as a prototype disaster-resistant and livable eco-village in Quezon City. The bamboo eco housing and community center complex was awarded the Green Award and $3,500, but unfortunately will not be built through this program. These unique bamboo houses are part of a much larger disaster resistant community concept for the Philippines designed by a group of Indian architects - Komal Gupta, Vasanth Packirisamy, Vikas Sharma, Sakshi Kumar and Siripurapu Monish Kumar. Their entry for the Design Against the Elements Competition is a master planned eco community with cluster housing units, two community centers, prayer and mediation space, a library, and lots of open green space. The community centers, also built on stilts, house a library, medical facilities, daycare center, market halls and a community hall. The landscape is designed to absorb a lot of the stormwater and also direct it away from the homes toward lower elevations. Various vegetated areas supply food for the community. 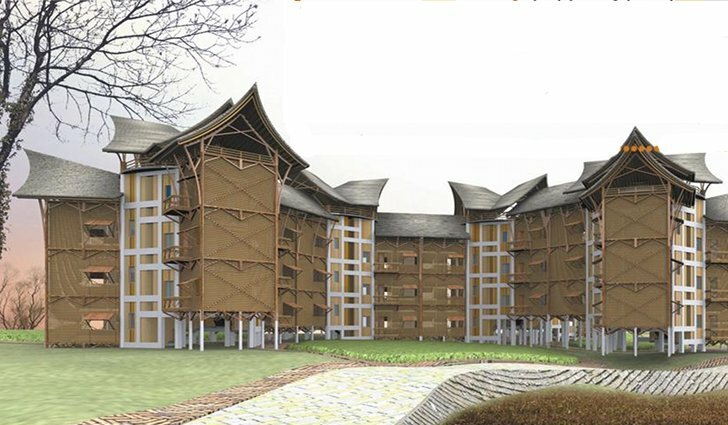 The side elevations of the bamboo eco housing buildings. Rainwater is harvested via the roofs and stored in a tank at the bottom of the structure. Emergency food stores and a water tank are kept secure at the top of the building. Each apartment is built around the central core with the kitchen and bathroom. A large bamboo deck is eventually converted into a living and bedroom by the family. The community halls are built off the ground to avoid flooding and with strong materials to withstand strong storms. Flooding from either monsoons or storms will not affect the buildings because of where they are built. In the event of a massive storm, the living pods may be destroyed, but the disaster proof core will remain. Bamboo living pods can quickly and inexpensively be rebuilt.